Graphic novels and movies have a thing in common in that they can add to the story by using visuals. And if the visual element is the face of an actor like Ed Harris or Viggo Mortensen who are able to use their facial expressions to express an emotion in a refined way this makes a scene all the stronger. It is something I often wonder how to exploit in written stories. Would it be possible to write down what happens without the support from the imagery? Carl Fogarty frowns when he looks down at Tom Stall. Tom looks up. His face almost expressionless as if resigned to fate. “I should have,” Joey answers and his lips twists into an almost imperceptible thin smile and his eyes gleam. For a brief moment they seem to connect. As if they shared a secret between them. As if Tom comes clean with Carl. Like in a confession. Which is interesting as Carl is dressed in black, almost like a priest(see the next scene). But is what is the reason for Tom’s smile really? Perhaps it is something different .. the next shot in the movie is Carl being blown away by Tom’s son. Is that the reason he smiles? His smile is ambiguous to say the least. I present another scene. This is the diner where Carl first appears to confront Tom. Carl is questing. Even Carl is not 100% convinced that Tom is Joey although he pretends to be. The movie up till then is one of uncertainty. Is Tom just Tom, or is he the killer Joey which Carl thinks him to be. Tom seems genuine innocent. Look at him. You can see Carl trying to gauge this man. Is he for real? Or is he faking it? But the question is why? Why does it matter if Tom is Joey to Carl? Why not just shoot him anyway? Tom is Joey and he meets his brother Richie Cusack, who is the head of a crime mob . We play the facial expressions in the scene next. We have William Hurt as Richie and of course Viggo Mortensen. Hurt possesses a wide range of facial expressions. Look while he chats with Tom/Joey and look what happens in the background. Richie knows what is going to happen, he orders it. The last scene: which is the first. At closing time, near dusk, two men enter a diner in a rural town, sit down and order coffee and cake. When the waiter tells them that they are about to close up, the older man shouts at him to serve them. When the waitress attempts to leave, the younger man stops her , forces her to sit down and locks the door of the diner. Then the older man pulls out a gun. “Do her, ” he orders the younger one. The second man leers over the waitress. Then the waiter moves with sudden speed. He smashes the can of coffee he is holding in the face of the first man. His gun spins away to stop under a table. The water jumps over the counter, grabs the gun, aims and blows the second man through the glass of the door. Then he shoots the first man in the head after that one jabs a stiletto in his feet. A moment of brief violence. A history of violence is a movie as based on a graphic novel. 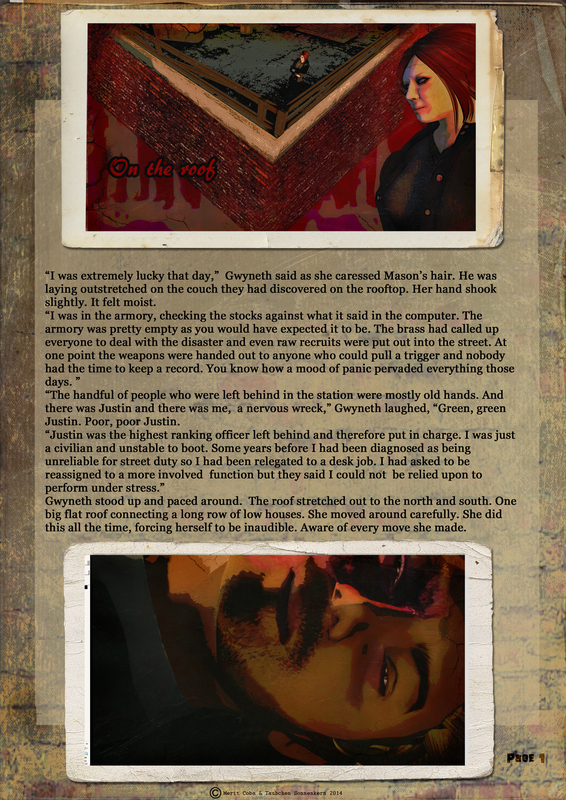 In a graphic novel the graphics dominate the story line. I would even say, more so than in a movie as graphics can be distorted, twisted, changed. The same applies to movies, given the many ways that a movie can be supplied with an effect, but up to now one sees that most movies are not made as graphic novels, but as movies. There are of course exceptions, such as Sin city because the director is actually the same person as novelist, but even sin city the novel is way different from sin city the movie. To get you an idea of how the comic looks here are a few pictures. As you can see, below the dynamics of a novel can add or leave out thing depending on their importance and give it an extra feel through the imagery as presented from picture through picture. In the movie this needs to be done by the actors guided by the script and in history of violence it is the facial expressions that convey the tale. The interesting thing is this. Graphic novels and movie influence eachother while having their own conventions at the same time. It would be interesting to see how the in turn influence purely written books. A feel for the novel. We were at the Cobra museum last Sunday(15 September) because we wanted to see Hundertwasser. It was also a way to have a look at what the museum has to show for we had not been there for years. Cobra used to be an art movement that was active between 1948 and 1951. However it has had more influence than the shortness of the life span of movement suggests. The museum is created to collect and present the art works associated with the art movement. It also shows works that influenced the art of Cobra and the art it influenced. It is located in one the suburbs of Amsterdam. It’s not a very big museum and the surrounding area is nothing to write home about, but it’s easy to access from the nearby highway. I wanted to write a short post about it, because I am still looking for a style that will fit my pictures better. 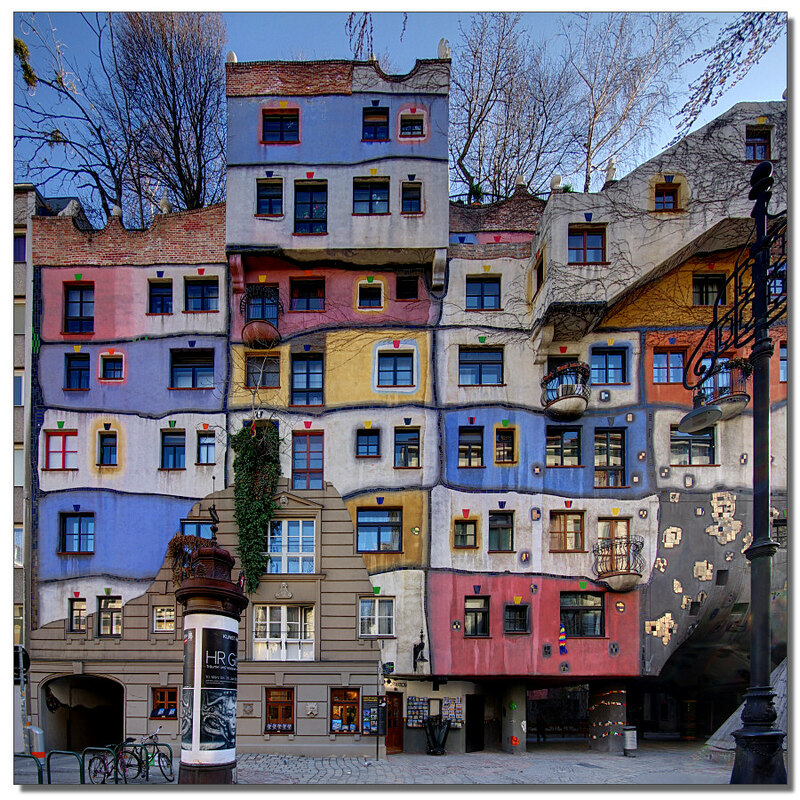 We knew Hundertwasser mostly from his buildings. Like the one on the picture to the top. A colorful scheme in which the straight line is broken. That was his thing. He did not like a straight line because a straight line he associated with conformity. So he rebelled against it by refusing to use a straight line in his works. At the Cobra museum we saw some of his earlier works. Works without a straight line. Here are some examples. Personally I am not touched by this art. It is something that does nothing for me.. However my companion liked it very much. So much even that she bought a poster of one of the paintings and hung it on her wall. I don’t have a picture of that particular painting but it is similar to the one’s a above. I think the style looks better as architecture than as a painting although it might make people edgy when everything is done in that same style. 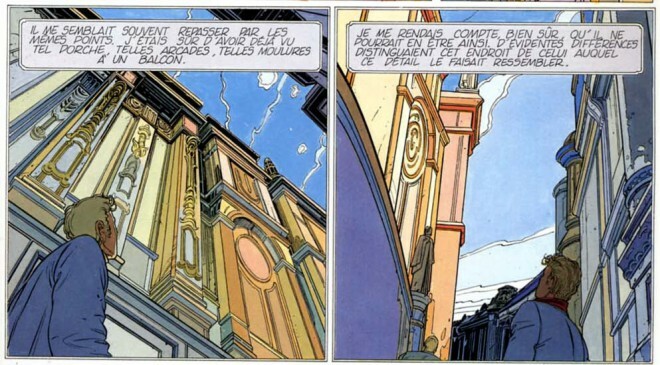 Incidentally, talking about doing everything in the same style: my brother used to have a few graphic novels whose stories took place in imaginary cities that were done wholly in one kind of architectural style. 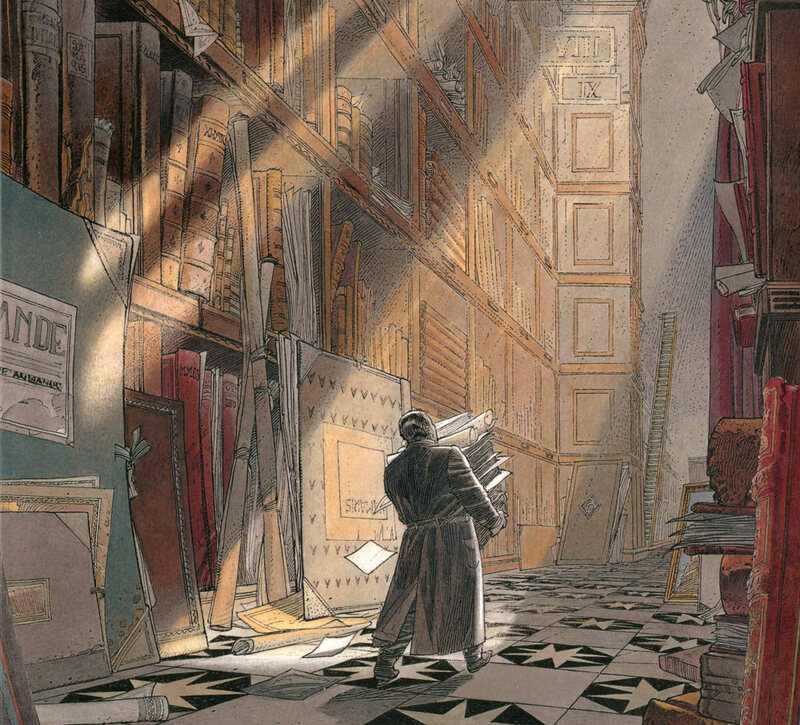 These novels were called Les cites obscures and made by Francois Schuiten en Benoit Peeters. They have been translated into English as Cities of the Fantastic. This English translation is a bit off in my opinion as the original French title is more sinister in sense. Which is more proper as there was something uncanny about the stories. Below is picture of the first book called the Walls of Samaris. This is the scene at the end and show what the main character sees after he has escaped Samaris. The city does not really exist as city. Instead it is kind of trap. 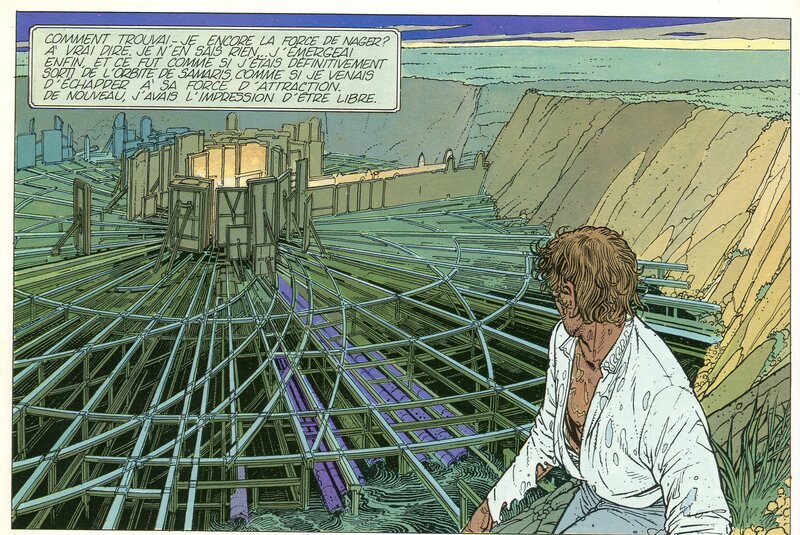 The unsuspecting visitor enters the city and then the city is created around him from moving panels who move over the tracks you see in the picture. In the story the hero even meets the inhabitants who turn out to be as fake as the city. It is never clear what they really are and why this city does it, but it can’t be benign as people who visit Samaris disappear. The hero eventually becomes suspicious and breaks out. But the story does not finish there. The ending is even more sinister than that. 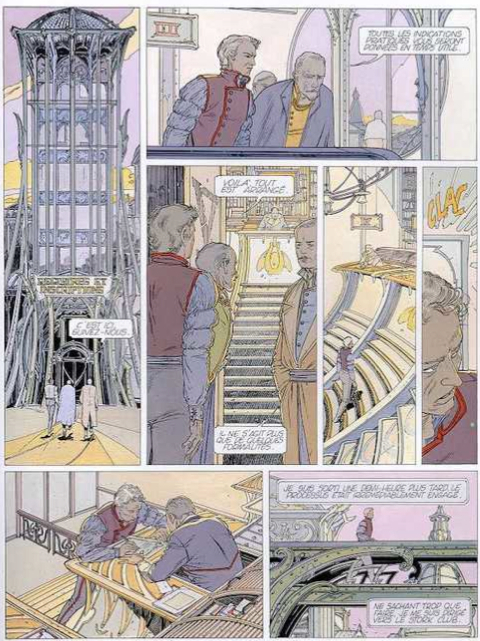 Next a few other pages made by Francois Schuiten, who made the pictures. Peeters was the writer. The mechanical city of Samaris with it’s straight lines is actually a menacing entity. See the straight lines in the picture below. The hero wanders through the narrow streets with tall buildings looming overhead that have all been done in a (neo)classical style. Straight lines dominate the visuals. It reminds me of Venice. The second picture shows the hero’s hometown. It is done wholly in Jugendstil or Art Deco. Curvy lines mostly. It is fascinating to see how the visuals are used to enhance the story. Which is a very strong point in this series, although many might find it strange or unsettling. Notice that the clothes are also done in the same style. They tried to capture the Jugendstil essence and turn it into clothing. And this brings me back to Hundertwasser. 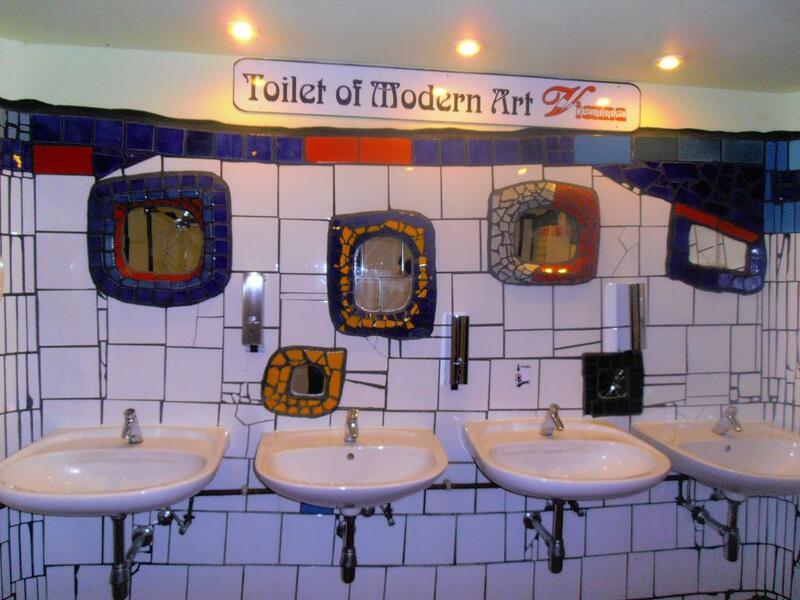 I read somewhere that Hundertwasser is getting to be more popular. And thus high art becomes popular art and thus becomes part of every day live. And perhaps that is the greatest tribute? 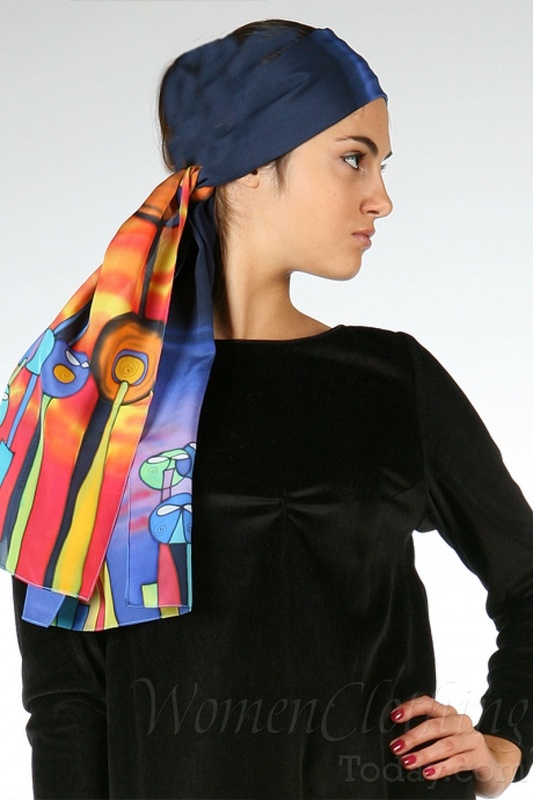 Who wouldn’t want his art depicted on a shawl? 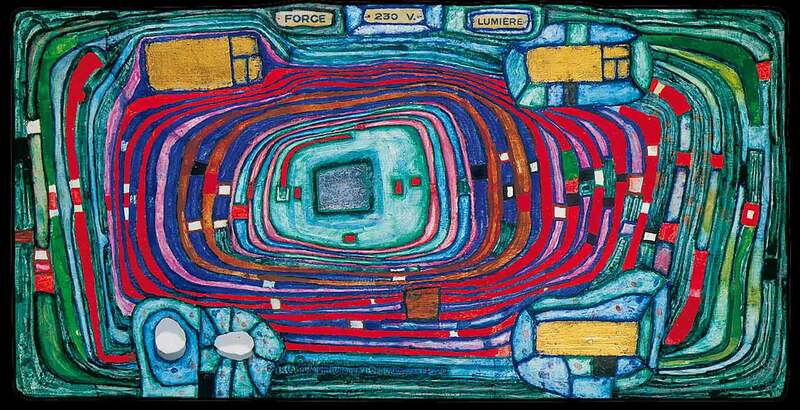 At least there is not one straight line in it so Hundertwasser can be happy. 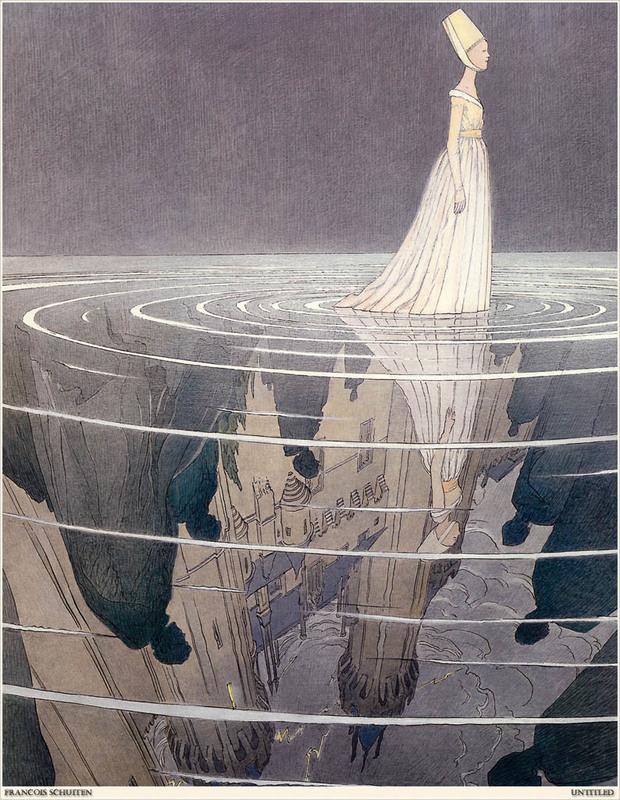 Since I am not much of a fan off Hundertwasser I end this post with one more example of the work from Schuiten. Enjoy!